I was not disappointed by the quality of gluten free cakes, as you will read in a minute, plus I was impressed by the decor and design which has gone into the look of the cafe. 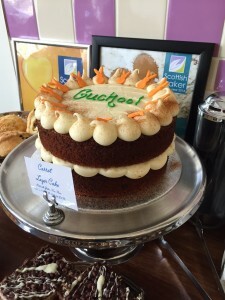 However, while Cuckoo’s Bakery is very much about coffee, tea and cake, it is also a lunch destination. With sandwiches, baked potatoes, soup, bread and a salad on offer, it is a good spot for a quick lunch with a friend. The lunch choice for the gluten free eater was slightly limited – they had run out of baked potatoes and soup with bread became just soup as there was no gf bread. With the choices on offer and clearly some very talented bakers on hand, I was slightly disappointed. It need not be too difficult to have a few gluten free rolls to hand? However, given the sheer size and amazingness of the piece of cake I had after my soup, I was really very pleased to have the space in my tummy to do it justice! The cakes at Cuckoo’s Bakery are simply beautiful, but it is most definitely not ‘style over substance’ (maybe this should be said as ‘stayle oever soobstance’ in a Paul Hollywood scouse accent?). 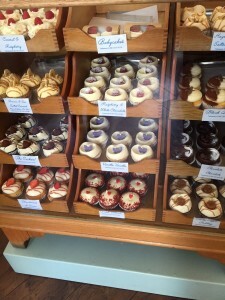 Again, the choice for the gluten free eater is not extensive: there was a banoffie cupcake or a slice of carrot cake. This is not a bakery that is promoting itself as a gluten free destination, so to have two choices is really ok, though more would be good as they are of such a high standard that wheat eaters need not feel they are a compromise. To my cake. I chose the carrot cake, which was a glorious confection on a glamorous stand that looked very tempting. And it was delicious! Light, moist, tasty and with a crunch of walnut. The cream cheese icing was very good and as the cake itself was not too sweet, it was not overpowering in its sweetness. This represents gluten free baking at its best – just wonderful, plus the little sugar rabbits added humour. The coffee I had with it was oomphy and delicious and large too. My particular praise has to go to the designer china. The Bakery has had its own china made, with Edinburgh icons on it, its own logo and it really is very cool. I went back to work well satisfied and very pleased that I have moved to an office very nearby. Cuckoo Bakery: I will be back, so please keep the gluten free flag flying.